Next week I will have so many pictures you will not believe it. I will keep you busy with my travelings and wonders of Puerto Rico. 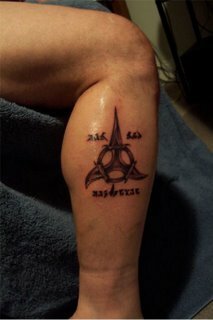 I went on vacation to my native Puerto Rico and got tattooed by a Klingon Artist , El Fibs, 5900 Isla Verde Ave, # L-4, Isla Verde Puerto Rico. Welcome back! Great tattoo. I'm too chicken to get one; at least for the time being. I can't wait to see the pictures and hear about your trip. Calvin, I was scared to get one also but now that I have one I want more! Awesome tat!! Can't wait to hear about your trip and see the pics!